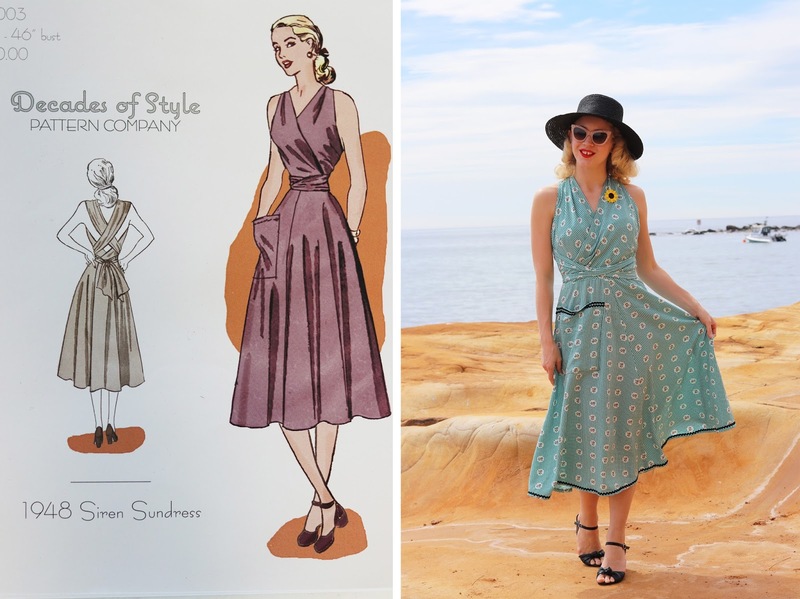 I've been working on a few garments with patterns by Decades of Style and I'm excited to finally be sharing one of the finished products, The 1940s Sirens Sundress! This dress probably took me about six or so hours to make but I couldn't be too sure as I could only get a little bit of time in for sewing over a few weekends. I used rayon fabric for the first time and although the end result was quite good it was definitely a tricky fabric to work with which meant the project took a bit longer to finish, though I'm not complaining as this rayon is absolutely beautiful to wear on a hot day by the water... Which is exactly what I did when I first took this dress out. 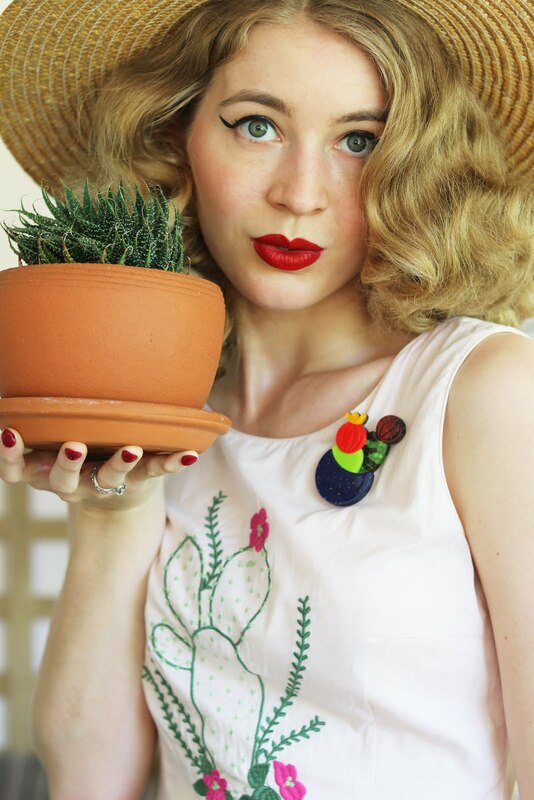 My thread kept jumping a lot as I was sewing with this fabric, especially when attaching the ric-rac... But being a patient person I kept on going as I always get so excited to for the end result. 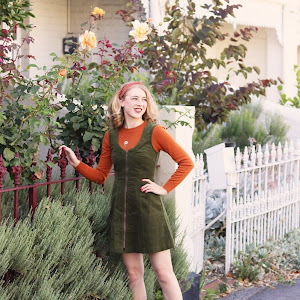 This pattern was very easy to follow and put together, the size guide is great too! 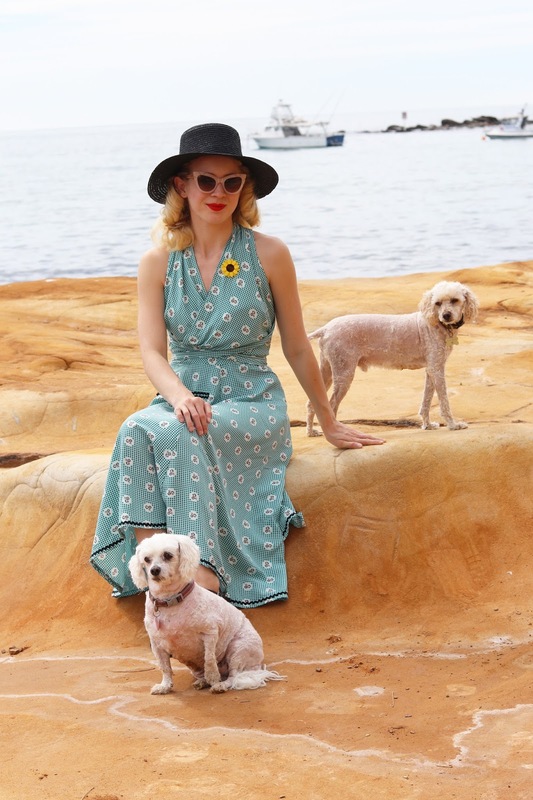 I love wrap dresses and this one is a little bit special with the gorgeous wrap around straps. I made the straps extra long and just cut to the end of my fabric to extend them, I also lined them too. The rayon + lined straps makes them a little more slippery but I think they look gorgeous. One of my favourite trimmings is ric-rac so of course I had to add it to this dress and I think it really completes the look of this dress. A low/open back dress is always a favourite for me and I just love how this dress is really quite elegant. I pushed my bikini down at the back for these photos as I didn't want to distract from the beautiful design of this pattern but it also looks cute with a bikini underneath, this will be one of my go to summer dresses for sure. After wearing it out I think I will add a few domes to the open wrap side of skirt as this rayon has a bit of weight to it but overall it sits really well in place. I'm a sucker for pockets like this so this dress is basically ticking all of my boxes for a cute summer dress. One thing that bugs me is that I did't cross the bodice pieces over the same as the image but it doesn't really matter, it's just the perfectionist in me when I looked at the pattern image haha... I didn't even notice it until I put in on my mannequin after attaching the skirt, I didn't feel like unpicking it so I let it be. I bought 3m of this fabric for approximately AUD$8 and metre and then I needed some more, went to Spotlight then following day and lucky for me it was in the clearance section for about $3 a metre so I bought the rest of the fabric of course! I would love to make it again with cotton as I'd love to have another version of it and give the pattern another go too. Decades of Style packs the majority of their patterns in big zip lock bags and the booklets are large too, they are of really high quality in many aspects. It's all this attention to detail that have made my experience so far with this brand a pleasure to work with. 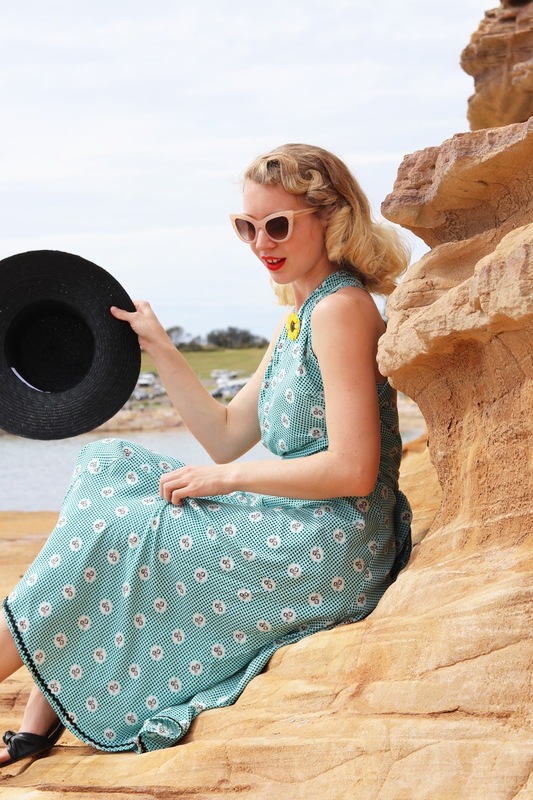 Their patterns range from the 1920s through to the 1950s, specialising in a wide range of historic fashion styles. 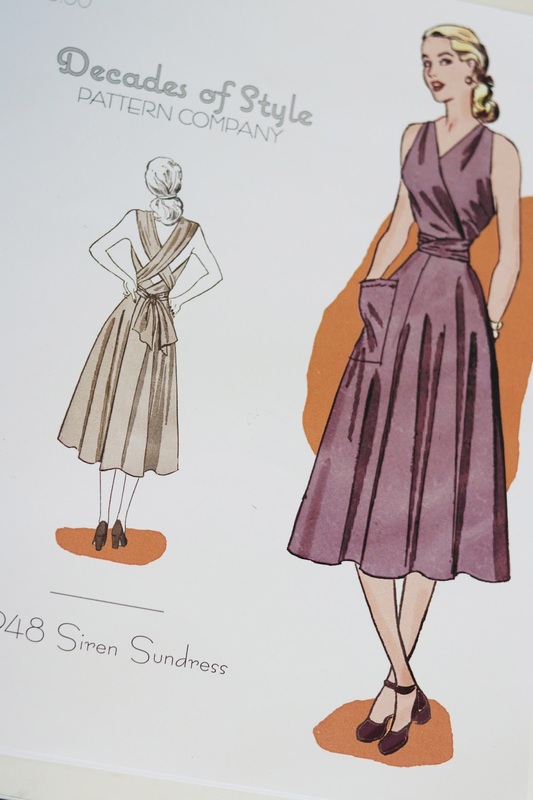 Other projects I have been working on are the 1920s Baltimore Dress and 1940s Boardwalk Duet Set, I can't wait to share these with you all soon! Gorgeous dress! You did a great job with it, and it's a beautiful fabric. I love that wrap detail in the back, it's so pretty and flattering. Such a pretty dress! In fact I think looks so much better than I thought it would from looking at the pattern illustration! Such a flattering and feminine bodice shape! Absolutely love it. And thumbs up for ricrac!